We just completed some work to link better with Google Calendar. You can easily create push your calls, one by one or all that you create, into Google Calendar as meetings. 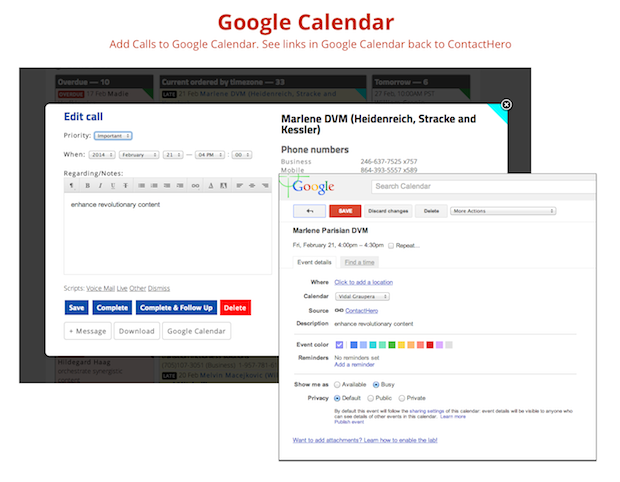 Meetings created in Google calendar have a link back to the original call on contacthero.com. Finally, any meetings in Google Calendar will show in your Calendar on Contacthero.com. To get started, either sign up for an account using your Google account, or if you already have an account visit your account page and click "Linking to Your Google Account"